GreenTech Movie Night at the Vashon Theatre! This free event will begin with a lecture/presentation about the history of U.S. Congressional Pages on Capitol Hill as well as the Washington State Page Program. A 30-minute documentary about the history of the Capitol Hill Page Program entitled Democracy’s Messengers: The Never-Before-Told- Story of Young Americans on Capitol Hill, narrated by Cokie Roberts will be shown with a question and answer period afterwards. The pre- documentary lecture will be co-presented by Marcie Sims, Green River College Professor and author of Capitol Hill Pages: Young Witnesses to 200 Years of History (McFarland 2018) and The Write Stuff: Thinking through Essays, 3rd Edition, Pearson), and Bruce Haulman, retired Professor of Green River College, Vashon Historian, and author of A Brief History of Vashon Island (History Press, 2016) and Vashon-Maury Island: Images of America (co-authored with Jean Cammon Findlay, Arcadia Press, 2011). 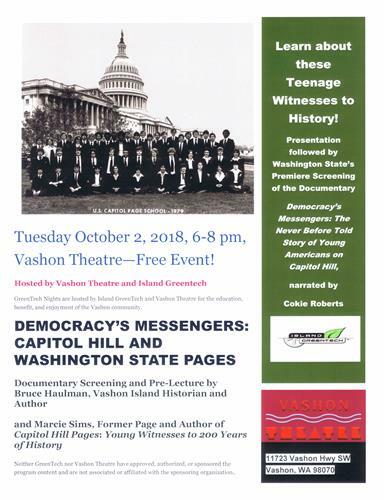 Our goal is to enhance the Vashon Community by sharing information about the history of both the federal and state page program and how that evolving history reflects the changing times and values of the national and local community (for example, pages as first-hand witnesses to history, pages and the civil rights movement, pages and the women’s rights movement, pages as witnesses to declarations of war and 9/11 and so on). Bruce will acknowledge former pages from Vashon Island who have served at the Washington State Page Program—who they are, when they served, the value to the teenagers themselves and to the Vashon Community, and Marcie will share some of her own experiences as a Capitol Hill Senate Page in 1979, some interesting discoveries about the history of the page program uncovered during her three years of research and interviews writing her book, and she will highlight some former prominent federal Senate/House Pages, including Vashon Island’s own Kurt Timmermeister (Kurt Wood Farms, Vashon) and Bill Gates. At the end of the pre-film presentation, Bruce and Marcie will share information and contact details for how Vashon Island teenagers can apply to be pages at both the state and federal programs. We hope to inspire more of our island young people to get involved in politics at both the local and national level.